Firstly, thanks to AJ for stepping up to help coordinate water stops in my absence! And thanks to everyone volunteering to pitch in and help keep everyone hydrated along the way. This week you’ll be doing 18 miles through the hills of Breakheart and the streets of Wakefield. Take a look at the maps, this one gets a bit tricky between water stops 3 and 4. That’s the only place you’ll be running somewhere we haven’t run yet in the training. AJ has posted a call for WS helpers on the forum. This is one of the more difficult runs to support so be sure to thank thoseÂ that volunteer their cars. If you can’t volunteer your car, volunteer a ride to those that are leaving their cars for you. And also remember to keep their trunks clean! The miles are starting to stretch out pretty far. Time to test out your marathon clothing and your pre-race meals. Enjoy your run! I have a large box of GU for the SLR water stops. Peanut Butter, Peppermint Stick and the rest of the usual flavors. If there is someone covering water stops for the next few weeks, I can bring these to you. 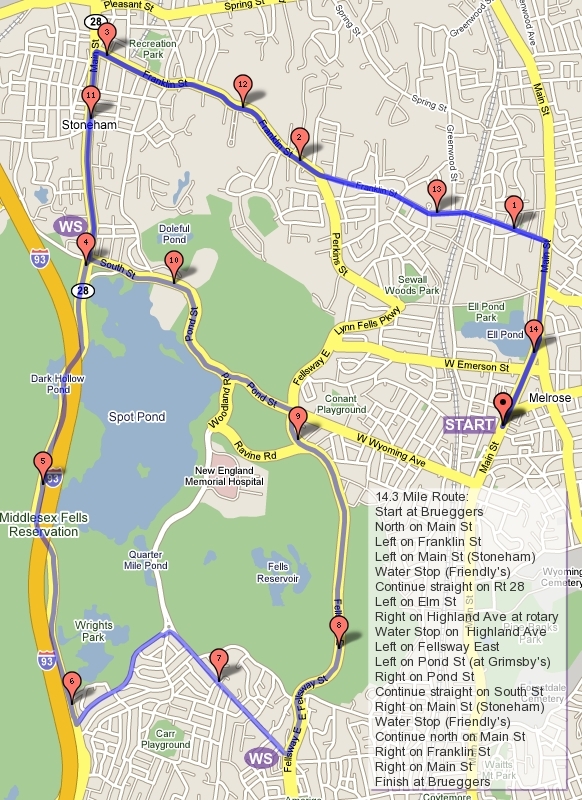 The route this week is up to franklin st, out to Main St in Stoneham. Turn left and head to Friendly’s for the water stop. Short route turn left to Pond St and back. Long runners take the backside of the pond round toHighland Ave and waterstop 2. Continue to the rotary at the Fellsway and go left. At Grimsby’s go left up toSpot Pond and right back to Friendly’s. Then head back the way you came. Water stops: I’m away so AJ has a bucket and I think Joe does. Please coordinate on your own who does what where and pick up supplies as needed. I won’t be back until March so I’ll take all the help I can get! I will not be able to support the next 3 long runs or so. If someone could step up and organize the runs, I would appreciate it. I’ll still post the pre-run info, but I won’t be able to do the water/gatorade shopping, collect the money, point runners in the right direction, or man a water stop. If I could get two people to share the responsibilities for keeping this going until I’m back, I’d appreciate it. Last week we had a good run out to Breakheart and through. There were at least 37 people running (because there were 37 plastic cups with names on them). The numbers stay strong, as did the runners pushing their way through the hills of Breakheart. The most interesting sighting of the day was a chalk drawing on the path at Breakheart seemingly pointing the way. If you saw it, you know what I’m talking about, if you didn’t I’m not saying what it was a drawing of. If you’re running short, you turn around and turn right on Park Â St past Friendlys to the front side of Spot Pond past the Zoo and left on Pond St to Wyoming to Main to Brueggers. For a run that’s more interesting, I suggest starting at Water Stop 1 and running with the crew through Winchester. From Water Stop 2 you’ll go RIGHT (yes, now you start taking rights) onto Rte 38, Main St in Winchester. This will bring you to a rotary. Pay attention here, follow the rotary counterclockwise as if you were driving in it. Don’t take the first little street, take a right at the second big street. I believe there is a historical sign there for Simmonds something or other. This will keep you on Main St/Rte 38. This will take you to another 5 way intersection. As you come here you’ll have Mystic Valley Parkway crossing in front of you, Washington St across the Parkway going rightish and another street going lefttish. You want to follow Washington St. Got that? Don’t turn on the street going right, cross and bear onto the street heading soft right. (Just don’t get lost) Take Washington St to Forest St. Look for the Gingerbread Construction Company for a landmark to where you turn. Follow Forest St up (and up, and up) to Water Stop 3 which is the same one as water stop 1. From there you continue on Forest St over I-93, turn right on Park St out to Friendly’s, turn right around the back side of Spot Pond, left up Elm to the hockey rink, left on to Woodland to the front of Spot Pond, and right onto Pond St to Wyoming back to Main St and Brueggers. Got it? WATER STOPS. Guess what, I can’t be there this week. I have Derek lined up to help with water stops, but I need one more person. If a shorter distance runner wants to start from Water Stop 1 they can help with that stop. Any volunteers? I’ll try to get the supplies to someone in Melrose tonight and they can give them to the volunteers at Brueggers in the morning. The outlook for the next 4+ weeks is that I won’t be at the Sunday Runs so we’ll be looking for people to help with the water stops. Let me know if you can help out. Thanks! So who’s in, ROLL CALL!